A torque cable is employed to allow a high degree of freedom for drive unit layout. 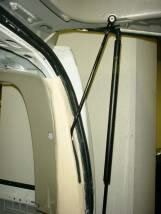 The actuator can be built into the trim. The compact design achieves a smart looking appearance. Manual operation force with low resistance. Safety is maintained when an object is caught in the door.